The opening track drops the listener at a campsite. The sound of matches being struck eventually gives way to radio snippets before landing on Genetics prog-rock transmission. “Creeper” was a multi-faceted rocker with multiple influences showcased, most prominently Midwest rawk royalty, Umphrey’s McGee. To deny the connection would be ignoring a fairly prominent part of their style and tone, but to pigeon-hole them as “trying to be Umphrey’s” would be an exaggeration. What they do have in common is edgy guitar tone, complicated compositions, and soaring lead lines that drive faster than Jeff Gordon on meth. “Conscious Conscience” reminded me of a mix between Moe. and UM both vocally and instrumentally. The instrumental phrase in the middle was as tight as hipster jeans and the melodic element was almost as impressive as the execution. The harmonic lead guitar lines lead the song through a sonic exploration ala Pink Floyd. “Something’s Lurking,” returned us to the campsite where bird calls and running water are interrupted by inhuman sounds. “Periscope” was an aptly named song. The groove had a stealthy, predatory energy that definitely made me feel like I was scanning the horizon for any threats or prey. This helped to close the concept of the album. With such varied energetic waves, this tune married the peaceful camp site and the “beast” element. Gliding between sly, aggressive, smooth, and cunning, I began to feel connected to the album as a whole rather than the individual tracks. “The Chase” may have been taken from the bear scene of the Revenant, but I’m not alerting Hollywood to it. It’s resolution to a heartbeat bled into the next tune. “Quamn,” brought the dance party into the mix as the album’s story line hit it’s pinnacle. I thought the song may have also fit nicely on a The New Deal album. Something about the fidelity had a space-infused electro-funk element to it that really drew me in. Gently landing on a cascading groove, “Winter Winds,” toured the mountainside with the calm ferocity of a seasoned hunter tracking his dinner. It was intense, articulate, coy, and ultimately forceful. The beast was certainly dead. “Out of the Woods” was another skit-like interlude as our camping trip comes to an end and the truck is started for the long journey home. “Air Force” provided a satisfying drive home as the band took a turn towards jazz fusion. As imprints of Al DiMeola mingled with blistering tone like some sort of Steve Vai piece, I realized how truly impressive Genetics latest effort really is. Genetics is the study of heredity and the variation of inherited characteristics. 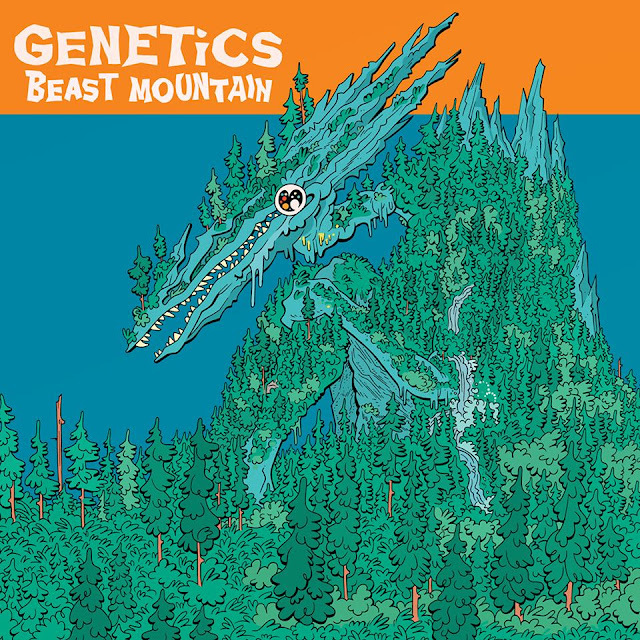 Genetics latest album showcases the heredity and inherited characteristics of a mighty strong lineage of musical pioneers… beasts. Coupled with their brand consistency, their album had a continuity and flow that may have been more impressive than any other single element of the whole.